We are excited to announce our third year of providing summer camps to students ages 7-13 years old. 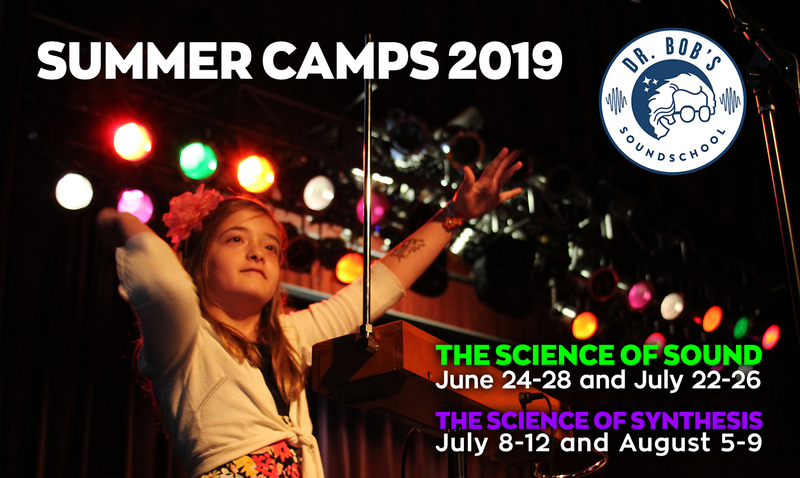 Our two camps, the Science of Sound and the Science of Synthesis, are created to engage kids in sonic exploration through fun, experiential activities! Join the Bob Moog Foundation as we explore the basic physics of sound through a fun, engaging, and experiential journey. We’ll learn all about how sound is made, how it travels, and how it is heard. We’ll delve into the cool concepts of vibrations, waveforms, pitch, amplitude, frequency, and more using a wide variety of musical instruments, including one of the earliest electronic musical instruments, the theremin (which you play without touching it!). We’ll also be using oscilloscopes and other tools to bring these concepts alive. The camp is rooted in our lauded 10-week curriculum, but will expand on the material taught in that program, so if your child has been through Dr. Bob’s SoundSchool this will build on that experience! The camp will be taught by Brooks Butler, a local musician, exceptional music teacher from Claxton Elementary, and a member of the team that created the original Dr. Bob’s SoundSchool curriculum. Come find out all about how synthesizers work, and how they enable us to sculpt sound! In this one-of- a-kind camp, we will explore the fundamentals of synthesis including explorations of the oscillator, filter, envelope, amplifier, and more. We’ll be using small synthesizer modules created by our friends at Little Bits®, and we’ll work our way up to exploring the principles through theremins, synthesizers and cymatics. This fun, experiential camp will be lead by August Worley, former engineer at Moog Music, Inc.
Dr. Bob’s SoundSchool, the hallmark education program of the Bob Moog Foundation, is an innovative 10-week STEM (Science, Technology, Engineering, and Math) curriculum that teaches elementary school students about the basic physics of sound including how sound is made, how it travels, and how it is heard. Over 12,000 students in the Asheville area have been inspired by Dr. Bob’s SoundSchool in the past six years! Our camps are an expansion on the founding principles of this curriculum. The Bob Moog Foundation carries on the legacy of synthesizer pioneer Bob Moog by inspiring children and adults through the intersection of science, music, and technology. We do this through both educational and historic preservation projects, including our new project, the Moogseum, opening in late May 2019. The Bob Moog Foundation is an independent 501 (c) (3) non-profit organization. We are not affiliated with the company Moog Music, Inc. Our support comes from donors like you.